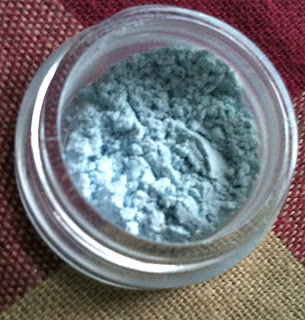 A couple weeks ago I ordered from the online mineral makeup company called Morgana Cryptoria, a rather cute gothic themed site that has alternative as well as trendy shades. 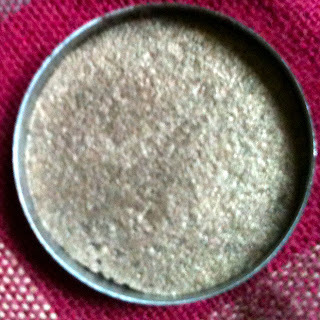 From the site I ordered two of their cult favourite Vegan Lipsticks, two eyeshadow samples (come loose in pots, but I've pressed mine here) and a sample of their Ethereal Veil Finishing Powder. First up is the two Vegan Lipsticks I ordered Absinthe (a dark rich blue toned green) and Rose Plum (a rose with a plum tinge). And like many before me I love them! Richly pigmented, and super super long lasting this are sure to make an impact! I love the hue of Absinthe- honestly my favourite shade of my favourite colour! 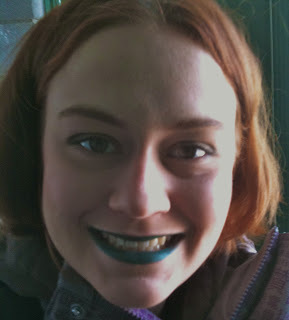 Yes, I know green lips are weird but I dig this so much I don't even care. It's a funky take on a gothic lip! Rose Plum on the other hand is just as great but for a more everyday occasion! Really really lovely lip colour that is quite unique, I don't have anything else quite like it. You really get a plum feel to it on the lips too, yet it doesn't look at all purple really. Both are a bit drying I found but I don't find it emphasizes my lip imperfections at all. Plus because these last for hours and through eating for the most part I'm in love! Plus, they were only $12 USD each, or for those of you who like to apply your lippies with a brush you can buy them in pots for only $5 USD. 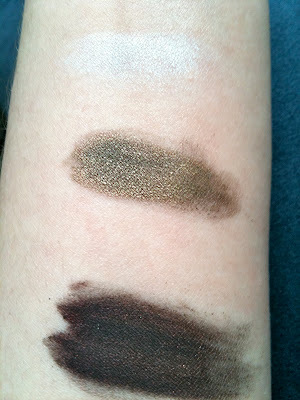 The two shadow samples I got were Mordred from the Medieval collection and Harbinger from the 2010 Haunted Eyes collection. Mordred is described as a deep mettalic bronze, and Harbinger is described as a deep metallic wine with flecks of aqua. 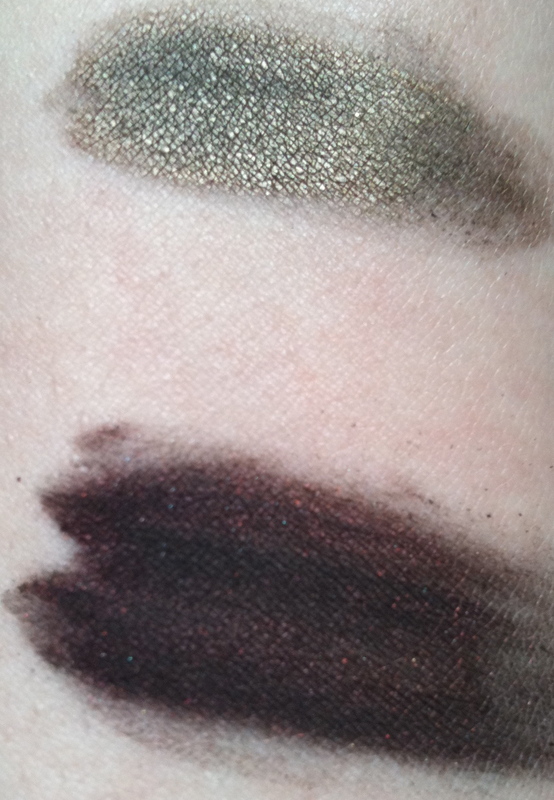 I find Mordred an antique dark brass/gold and Harbinger a blackened red with the smallest amount of aqua shimmer. I found Mordred really lovely, richly pigmented and great metallic shine with subtleties that made it seem like real metal. 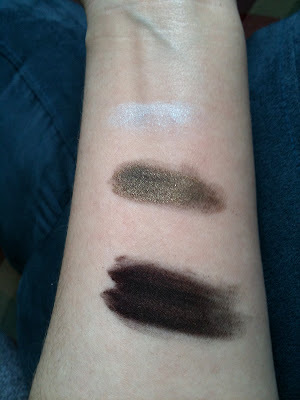 I didn't like Harbinger as much as I found it chalkier and less pigmented, as well as blacker than I liked. All three were swatched on top of Pixie Epoxy. Overall, I'm loving Morgana Cryptorium! The lipsticks are fab and I'll be going back for more (especially as a couple days after I ordered the new shades of lipstick shades were released). 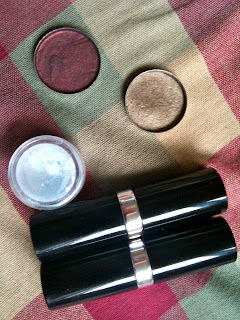 I'm eyeing up Roses and Violets, Nightshade, Sunset Peach, and Coraline's Kiss. 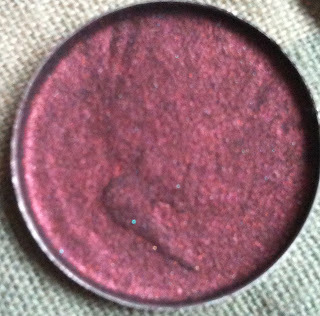 I want to try a few of her other eyeshadows as well such as Chivalry, Axe to Grind and Lady Godiva from the Medieval collection and Brew HaHa from the 2010 Halloween collection. Plus shipping was quick too! As a side note I adore the type face she chose for her labels, really cute! What do you think of Morgana Cryptoria? Labels: blue, Eyeshadow, FOTD, Gold, Green, Lipstick, Morgana Cryptoria, Pigment, Red. Yes, the green is strange but I totally adore it! It makes me feel like a wood sprite or something lol! Also because I'm in science there is very little colour/creativity stuff so I source all my creative energies into crazy make-up! I actually wore this to school and the amount of strange looks I got was hilarious! Morgana Cryptoria is a very little known Indie company so that's probably why you've never heard of it! I hadn't heard about it until recently either. I was impressed though! OMG! I actually like that green lipstick on you! It has that magical, ethereal, fairytale type thing to it! Zoya Summer Buy One Get One Free Deal!